Author(s) Closs, Gerard P.; Krkosek, Martin; Olden, Julian D.
Freshwater fish are one of the most diverse groups of vertebrates, but are also amongst the most threatened. With contributions from leaders in the field, this is the first assessment of the global state of freshwater fish diversity, synthesising the opportunities, challenges and barriers facing the conservation of freshwater fish biodiversity. The book includes the first global assessment of the number, type and distribution of threatened freshwater fish species, discussing the features of freshwater fish biology and ecology that render so many species vulnerable to extinction. Introductory chapters on why freshwater fish are so sensitive to environmental change and disturbance lead into chapters providing detailed reviews of the key threatening processes and potential solutions. 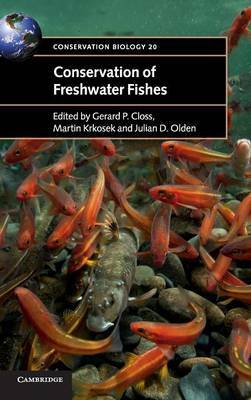 A concluding chapter summarises the key issues and looks to the future for opportunities and challenges for the conservation and management of freshwater fish.